I am the second person to MAKE A COMMENT!!!! WOO HOOO!!! Cardboard colin Rox!!! Go Cardboard!! 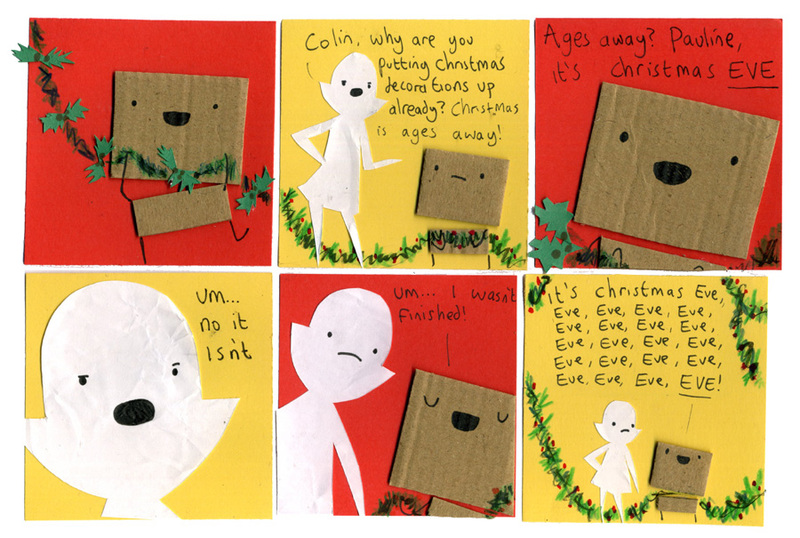 As much as I ADORE darling Colin, I think this would annoy me almost as much as it does Pauline. What a long sentence! The decorations look pretty but is that all he has ?! Yaya? r u the Yaya in WAB?? I AM RHIANN!! THE RHIRHICOCO THING!! Im the same way with colin. I started putting my little christmas tree before thanksgiving! So the stores put out Christmas decorations on Christmas eve eve eve eve eve eve eve eve eve eve? Well MY mother only lets my family put out the Chrismas decorations after Thanksgiving. It’s okay Colin I’ve been decorated for a week now. Reminds me of Harold Lloyd taking to leaving his famously massive tree up all year round when it grew too elaborate and he got too old to mess with decorating every year.